Clockwise left to right: Jason Kuykendall, Ron Campbell, Michael Gene Sullivan, Tristan Cunningham, Ajna Jai. Photo courtesy Kevin Berne and Theatreworks. One of my favorite theatrical traditions is the small-cast comedy. Beginning with Ludlam’s Mystery of Irma Vep and popularized with the Broadway adaptation of The 39 Steps, these plays make use of character actors’ talent and elaborate costumes to portray dozens of parts with a cast of five or fewer. 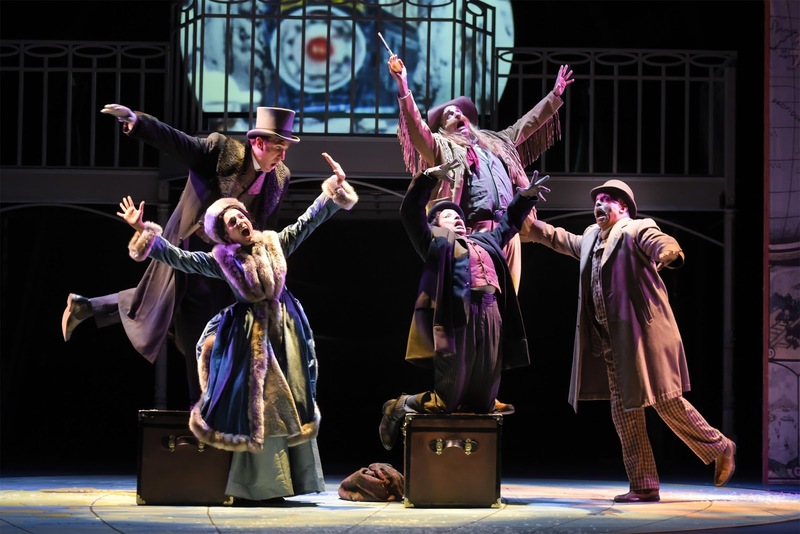 Mark Brown’s adaptation of Around the World in 80 Days, now playing at Theatreworks, pays tribute to Jules Verne’s classic adventure tale with a lean group of actors and a delightfully irreverent script. Director Robert Kelley understands the secret to good farce: Bringing the comedy over the top as much as possible without disrupting the core of the plot. Most of the cast portrays a number of exaggerated characters apiece, including priests, police, and rugged sea captains. Ron Campbell shoulders the bulk of these roles, his funniest work done with the cavalier Colonel Proctor. Unlike other small-cast comedies, there’s a relatively high number of recurring named characters, making the humor less reliant on metatheatrics and more on standard farce. Unflappable main character Phileas Fogg (Jason Kuykendall) serves as a grounding element to this chaos, with energetic and loyal servant Passepartout (Tristan Cunningham) bridging the gap between clown and straight man. Cunningham’s circus experience aids her in the mainly physical work required of the character, while Kuykendall’s confidence propels the plot implacably forward. Michael Gene Sullivan’s blustery Detective Fix and Ajna Jai’s timid-yet-powerful Aouda round out a stellar cast. One of the unique technical elements of Theatreworks’ production is the use of Cameron Wells as a foley artist. Wells helps express the numerous international locations of the play through special effects that don’t obscure the action onstage, and accents the humor of scenes to make them even funnier. Anachronisms like the Law and Order gavel sound are scattered throughout the play, not enough to cloud the original work but sufficient to add a new layer of humor. Around The World in 80 Days at Theatreworks ties together classic adventure, vaudeville comedy, and modern metatheatrics in a unique package. No matter how familiar you are with Jules Verne’s original story, you will find something to appreciate in this production. Around The World runs until December 31st.